This is part of the Cool Down With Agatha Christie summer extravaganza. 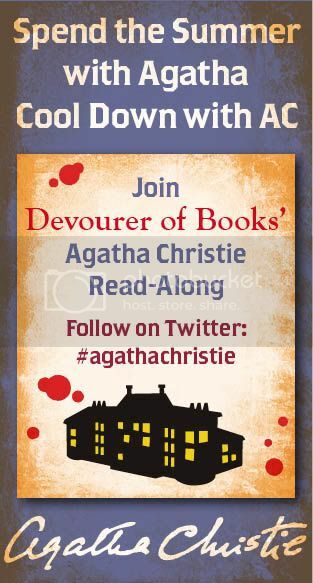 Three participants in today’s discussion will win a copy of next month’s readalong book, Ordeal by Innocence, as well as an Agatha Christie mystery prize pack. Next month we will be reading Ordeal by Innocence, if you would like to join us, please sign up on the Google form. I had written this book because it was so difficult to do that the idea had fascinated me. Ten people had to die without it becoming ridiculous or the murderer being obvious. I wrote the book after a tremendous amount of planning, and I was pleased with what I had made of it. It was clear, straightforward, baffling, and yet had a perfectly reasonable explanation; in fact it had to have an epilogue in order to explain it. It was well received and reviewed, but the person who was really pleased with it was myself, for I knew better than any critic how difficult it had been. What were your general impressions of the book? And Then You Were None is probably one of Christie’s most famous works, and almost certainly her best-known standalone. Was this your first experience with this book? If so, was it on your radar before this? If not, how did it hold up on the reread? As Christie referenced in her autobiography, And Then There Were None is perhaps the ultimate in locked door mysteries. Did you have any idea who the culprit was or how he or she manufactured the crime? Who did you initially suspect, and did that change as the book progressed? Even though I had read this before and remembered the basic outline – and before long even the murderer – And Then There Were None terrified me in a way that none of Christie’s other books have. Did you find it particularly frightening? What about it lends itself to palpable fear (if, indeed, you believe it does)? What was your opinion of the use of the device of the epilogue to solve the murder, when nobody else was able to do so? I switched back and forth between being in awe and being terrified while reading AND THEN THERE WERE NONE, even though I had read it before. I did remember who the culprit was – or, at least I did after 75 pages or so – but that didn’t mitigate the amazing tension Christie created or how impressed I was at this impenetrable mystery. I think it was so scary because Christie did such an amazing job bringing her setting and characters to life, the knowledge that every single one of them would die was simply chilling. I know I say this often about Agatha Christie, but really, the plotting and execution of And Then There Were None show the mystery novelist at the top of her game. I think I first read this when I was eleven or twelve. I liked it more, I think, the second time round because (amazingly) I didn’t remember whodunit, and over these past twenty years, I’ve grown to have such an appreciation for Christie’s ability to hide a murderer in plain sight. See Miss Lemon’s review of And Then There Were None at Miss Lemon’s Mysteries. I should have added that while the epilogue resolution is the only slightly disappointing aspect of the novel, I can live with it given that it’s a standalone. Without HP, how can there be a big drawing-room revelation? * I generally loved it. It will be a book that I hand to my kids to read at about 12/13 yrs old and hope it hooks them. I didn’t remember the murderer by name but I did recall it was someone on the island. I also couldn’t remember how they pulled it off. * No. I first read this book when it was titled Ten Little Indians back in 7th grade. I believe it is the book that made me want to read mysteries. * I loved the epilogue and it’s something that doesn’t really get used in this manner much these days. I thought it wrapped up the novel very well. This time around I felt that some of the language was out of date and at times I felt it took away from the story but I also wouldn’t have them change it to update it. Here is the link to my review. I think the epilogue is the most terrifying part of the book. You can see how craaazy this person was, and that’s just scary no matter how much time has passed since the book was written. This has always been my favorite Christie book. The first time I read it I had no idea who was the mastermind behind the killings. It’s so wonderfully creepy! Judge Wargrave—An early form of Dexter. Ha! I like the comparison. I have enjoyed Agatha Christies books since I was a young girl and at one point in my life, I owned every paperback she had ever written ( over 90 if memory serves). I remember seeing the movie version of this called Ten Little Indians and thought it was so very clever! I didn’t figure out who-done-it either!! I remember seeing the movie version as well. I checked imdb.com and there was a film version listed, but some of the character names are different. I remember the film freaked me out. Wish I had seen the play that others are writing about! This book is so well thought out that every time I read it I find it suspensful and quite a bit frightening. It’s frightening because you realize that they are all trapped on the island with a murderer with no chance for escape. The use of the epilogue at the end while a bit too convenient, does give the reader some closure on how it was done. I do not believe the story would have suffered at all if Agatha Christie had left it off. I wonder about that. I’m generally opposed to the use of an epilogue for this sort of thing, but I have no idea how she could have led us to solve the crime otherwise, and I’m not sure the book would be as popular if it was left with us having no idea of whodunnit. This is the first Agatha Christie book I read. It is also my favorite. I love her books because I can’t figure it all out before finishing it. I enjoy the surprise and getting a mind workout. Other authors are usually more easy to figure out. I would suggest getting this book on a school list of expected reading to help stimulate those young minds. Yes, it may be somewhat depressing but they make those kids read Hemmingway for crying out loud. This book in particular is very good for that (it was the first Agatha Christie I ever read too, way back in the day). Wouldn’t it be interesting to see an entire course on critical thinking based on the works of Agatha Christie, Arthur Conan Doyle, and the like? I love Agatha Christie. She was an amazing author. I have many of her books but not near as many as I would like to have. This book I actually found a bit creepy but also could hardly put it down. I love the way she used the epilogue to finish it. I have read it more than once and never can remember whodunit or how it was done. I have never read the book before. I have seen it on television. This is the type of story where you get under warm blankets and curl up with. Well, this too was the first AC Book I read as a teenager, but I remembered it being titled Ten Little Indians. This is the reason I got hooked on Christie. I haven’t read this book in over 25 years and it was still as good as it was the first time. It was so good I read it in one night and could not put it down! I did pick my suspect early on in the book as well as the motive. I thought I knew why s/he was committing all the murders. S/he had the means to learn about all these crimes, I was sure. But then, just like Christie, she killed off my suspect and I was left second guessing myself (but I read the book before and couldn’t believe I was wrong..!!!). I started to think that maybe there was someone else on that island. But that was silly, right? I think the best part of this book is the character development and watching even the most composed characters unravel at the end. That was terrifying to me (not to mention that I was finishing the book at midnight….). I knew someone was playing God, but after my “suspect” too was murdered, I didn’t like my remaining choices as the murderer with those left on the island. I’m probably one of the few folks who NEEDS an epilogue because I can’t stand it when things are not tidied up at the end, which is probably why I love HP so much. I need that “dining room scene” when everyone is gathered together, where the whole mystery is set forth to all the guests/suspects and someone (HP) lays it all out for you. My mind needs to tie up all the loose ends. As I said, I thought I knew the murderer… but when he was murdered, I couldn’t remember how things ended. The thought had crossed my mind that there might be 2 people in on it… but I couldn’t figure out which of these people, who by now were terrified of each other, would be gullible enough to trust one of the others… Well, that question was certainly answered for me. This book shows why she is still the Queen of Mystery. The gore and violence are kept to a bare minimum (no gory descriptions). The reader is left to the imagination, which can be a far scarier thing. She uses psychology brilliantly. The small bits of “supernatural” (for lack of a better term) are masterful. I was completely creeped-out by the scene with Vera and the seaweed in her room because she built up the suspense and left me, the reader, to let my imagination run!!! Completely freaked me out! Probably still my favorite non-HP book. For some reason, I thought I had seen a movie re-make of this when I was younger… anyone know if there was a movie??? (I’ll check IMDB and get back). Wonderful book, great comments!!! Thanks all for sharing such brilliant insights! Really enjoyed reading this again. It was indeed titled “Ten Little Indians” when I first encountered it. Ms. Christie’s idea of a locked room mystery is amazingly gruesome. The clever, and appalling, ways she dispatches her victims are still a surprise after many years in her company. The television series “Harper’s Island” owes a huge debt to this novel. I have been reading this book again and again for more than 25 years. It never fails to scare the bejeebees out of me. Just the thought of being stranded on an island, cut off from all communication is in itself scary. Throw in a mysterious murderer and I am in panic mode. Brilliant writing, Ms. Christie! This is the real mystery book.I’ve read it so many times but I still hold a curiosity of who the culprit was and feel the chill of being trapped with the rest of the characters. This book is so carefully written to make the reader feel the chill until the very end.can’t say that I have read such amazing book like this one.love it! I first saw the original film in B&W, so scarry!! but nothing compared to the book! I was never able to read it while I was alone or at night. It’s been years since I last read it that I forgot who the murderer is! i love forgetting, it gives me another chance to enjoy a fantastic book. There is a movie called And Then There Were None from 1945. The ending though sticks with the play ending, not the novels. I actually enjoy both endings (my romantic side is pleased by the one in the movie.) I watch the movie at least once a year ever since I found it on DVD. I enjoyed the stream of consciousness writing that allows you inside the mind of an individual but still hide the identity. AC uses this device very well and when it wasn’t used that often. *I LOVED this book. The novels and short stories are my favorites in this challenge so far. The mystery is so clever and then you have the added layer of not feeling very sorry for the victims once their secrets are revealed. Michael was a psychopath in Endless Night and in this novel we have another killer who is also psychopathic but different in that he will only kill those that he has judged “guilty”. * This is my first full length “locked door” mystery though I did notice a somewhat similar set up in The Mousetrap. Once everyone was murdered I had no idea who the real killer could be. I never figure it out but that’s okay because I like surprise. Actually in most mysteries I usually find myself reading ahead to the end but strangely I always wait patiently for the end shocker in the Christie novels. *I thought the part where Vera hanged herself especially chilling. * I loved the Epilogue, it was one of the best that I have ever read,another favorite is the one in Harry Potter. So glad I found this link, I have been searching for the perfect Agatha book to begin with. Thanks. I have read all of Christie’s work at an early age and adored it. This book, particularly, scared me – probably because ”human nature”, as she calls it, is frightfully accurate in it. The thought that people can appear so deceitful is giving me chills, even today. Also, the fact that the novel didn’t include any of the regular detectives (Poirot, Miss Marple, Quin, Tommy&Tuppence) meant more insecurity on that level – as a reader. I have been a Christie fan for many years… Ten Little Indians is my favorite book. I do not read many of the stories involving Miss Marple. I am a Poirot fan, myself! I am a middle school teacher, and my students love it when I have them pick a mystery book to read for their book reports. Often they will pick up an Agatha Christie! BTW I did peg the judge as the culprit in Ten Little Indians. I kept thinking while I was reading it, “how could he accomplish these murders”. I think in real life there would have been a hitch somewhere at the end. In real life I do not think Vera would have hanged herself.